Having trouble finding the perfect gift for the man in your life? This Valentines gift guide may the be inspiration you were looking for. I’ve kept my eyes peeled over the past few weeks to find some top gift ideas. I’ve chosen a variety of styles and prices so hopefully you’ll find the perfect gift. 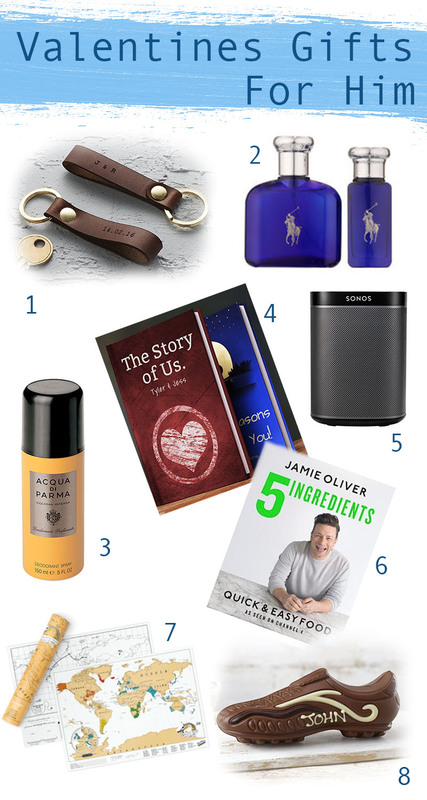 If you still haven’t found what you are after check out Fashion related gifts for him or my Valentines gift Guide for Her. I love buying personalised gifts for friends and family as they are extra special. This leather keyring is a unique alternative to what you generally find on the market. It’s sleek and fashionable design would appeal to many people plus it’s practical as everyone needs a key ring right? I don’t know any man who doesn’t like a good aftershave and there are some wonderful gift sets out there for Valentines. I particularly like the Ralph Lauren scents, this blue one is described as aquatic and musky. The top notes are melon, mandarin and cucumber which gives this fragrance a freshness. This is followed by basil, sage and geranium at the heart and finally a base of suede, musks and woody notes. The result? A fresh, clean, masculine scent. I’ve bought this fragrance before as an aftershave and both my Husband and Dad loved it so I was really pleased to find it’s now also available as a body spray. The scent is sophisticated and masculine. I love that this brand isn’t commonly available so odds are the man in your life won’t be wearing the same as one of his friends. Another personalised gift idea is to create a love book. This idea is super cute and allows you to list all the things you love about your partner and customise the pages and characters to look like you. You even have the choice of picking the cover and title page. This is a sweet keepsake idea and would be perfect to look back at over the years. If your loved one enjoys listening to music this speaker could be right up their street. It’s sleek design would fit nicely in any home and is available in both black and white. The speaker is wireless so you can play music from your phone and other streaming devices and also control it through your phone via the Sonas app. My husband got this recipe book for Christmas and loves it because the dishes are quick and easy to create. Also, as the name suggests each meal only use 5 ingredients (plus some base ingredients such as salt and pepper). This is the perfect gift for those who like to experiment in the kitchen but maybe have little time on their hands. I can’t wait to try more of these simple yet tasty recipes. If you are planning to travel with your other half why not indulge in this cute scratch map so you can share all your adventures together? Every time you visit somewhere new you can scratch the foil covering one of the countries, ticking them off one by one. It would be a lovely memory to keep this on your wall and reminisce about your past travels and and celebrate new places you are jetting off to see. If you want to surprise your man with a sweet treat how about some delicious chocolates? The Milk Chocolate Boot is perfect for those football lovers or those who prefer Valentines gifts that aren’t as ‘lovey dovey’. It’s also customisable so you can add a personal touch to make it extra special. Thorntons offer a huge assortment of chocolates from individual selections to boxes, models and heart. What would be your perfect Valentines gift? My fiance would actually love the Jamie Oliver book!